Hyundai has announced plans to stage the world premieres of four new models via a live webcast this week. No details of the models have been provided, but a live stream from Hyundai's 2014 Product Momentum show will commence at 09:20 GMT (7:00pm AEST) this Wednesday (December 10) at new.livestream.com/HyundaiEurope. The Korean car-maker said all four new models will be launched in Europe next year, as part of its commitment to release 22 new models and derivatives in Europe by 2017. "Hyundai Motor will live broadcast the world premiere of four new models from its Product Momentum show, bringing consumers, fans and followers closer to the latest news from the brand," it said. "Audiences across the globe can witness the official unveiling of four new models, set to hit Europe's roads during 2015. The Hyundai Shell World Rally Team will also join the event to share latest news, review their inaugural season in the World Rally Championship and look ahead to the excitement of the 2015 season. "This latest Hyundai Motor live stream aims to build on the success of previous shows, such as the 2014 Paris Motor Show webcast, viewed online by more than 50,000 people." 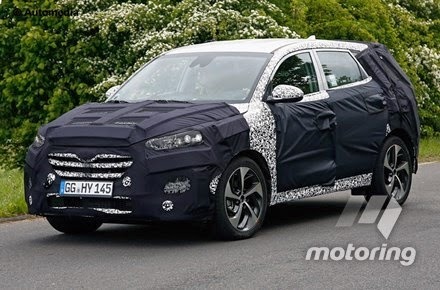 motoring.com.au believes the four models will be the facelifted i30, facelifted Veloster, facelifted i40 and all-new ix35 (pictured), all of which are expected on sale in Australia next year. In fact we expect the revised i30 and Veloster to be released here not long after Hyundai's next new model release Down Under – the new Sonata in early February – with the upgraded i40 range and all-new ix35 to follow around mid-year. Combined with a new-generation Elantra, which we understand will make its world debut at the Detroit motor show in January, Hyundai could launch up to six new models next year in Australia, where it is already the second best selling brand so far in 2014. And that's assuming 2015 doesn't see Hyundai decide to import the latest i10 micro-car, establish a business case to ship the new-generation i20 from Europe, or stage a surprise reveal and release of a second-generation Genesis Coupe. Given the Hyundai Shell World Rally Team will also be on hand at this week's event, the company could also unveil its 2015 WRC challenger, based on the new i20.